This study will further elaborate on relevant results of the ESPON TIGER analysis on FDI flows, as well as experiences of the ESPON FOCI and ESPON ITAN projects. The main objective of this service contract is to provide recommendations that could support regions and cities in their positioning and defining their policies towards receiving FDI, as well as integrating the attraction of foreign firms in regional development strategies. Further reading. What are the global patterns and recent trends (10 years) of inward FDI flows to the EU, and how do they affect the overall territorial development of the European territory? 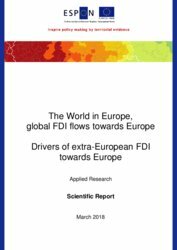 What relevance do inward FDI flows have for regional growth and competitiveness as well as for reducing economic disparities in Europe (among more developed, transition and less developed regions)? 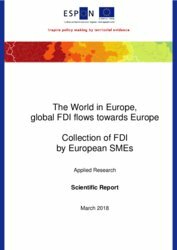 What types of regions and cities receive foreign investments and for which economic activities (manufacturing and service industries and sub-categories)? What territorial factors seem to determine FDI location? How do macroeconomic factors and local regulations affect inward FDI flows territorially? What policy measures could be implemented to attract FDI in order to boost the competitiveness of EU territories at different scales (global, European, transnational, national, regional, urban)?